Snrky: Well have you found any bugs yet? Well have you found any bugs yet? It goes against logic, or so it seems, to let a developer spend too much time testing, but I think there might be something to it -- at least once you approach the acceptance testing phase. There is just too much temptation to veer towards "fixing the code" rather than "fixing the bugs" what with the source code just right there. What's worse, even if they do focus on "fixing the bugs", one must first find said bugs, which from the developers perspective means being told, "No we just assume your code is definitely broken (even though you might actually be a little bit proud of it), so go find all the broken stuff and fix it." How depressing, not to mention boring. And you wonder developers hate testing? Title: Well have you found any bugs yet? 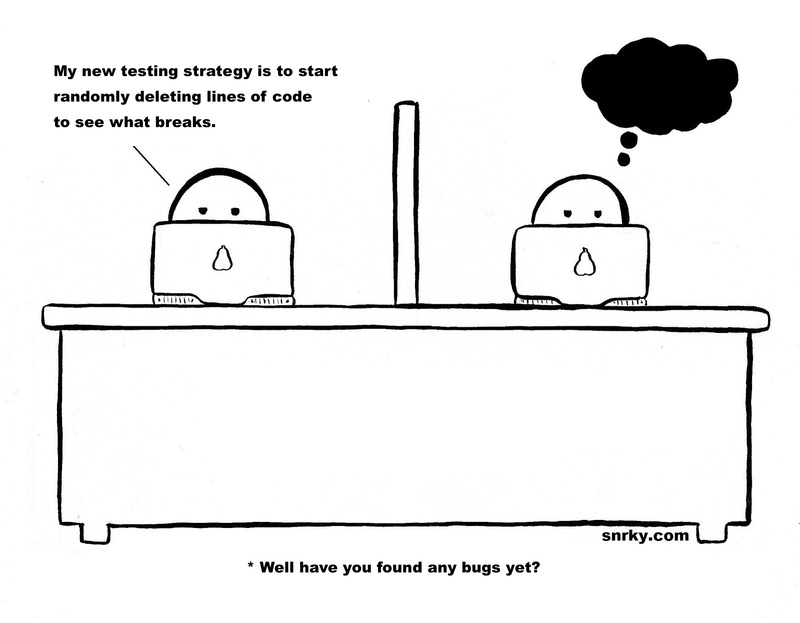 Snarky: My new testing strategy is to start randomly deleting lines of code to see what breaks.